The VCS repository you want to use has to be accessible to Weblate. With a publicly available repository you just need to enter correct URL (for example git://github.com/WeblateOrg/weblate.git or https://github.com/WeblateOrg/weblate.git), but for private repositories the setup might be more complex. To share one repository between different components you can use a special URL like weblate://project/component. This way, the component will share the VCS repository configuration with referenced component and the VCS repository will be stored just once on the disk. 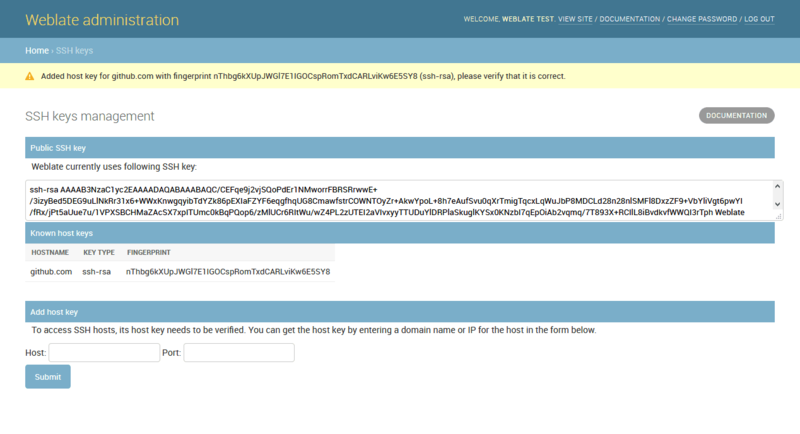 You can generate or display the key currently used by Weblate in the admin interface (follow SSH keys link on main admin page). Once you’ve done this, Weblate should be able to access your repository. On GitHub, you can add the key to only one repository. See the following sections for other solutions for GitHub. To access protected HTTPS repositories, you need to include the username and password in the URL. Don’t worry, Weblate will strip this information when showing the URL to the users (if they are allowed to see the repository URL at all). 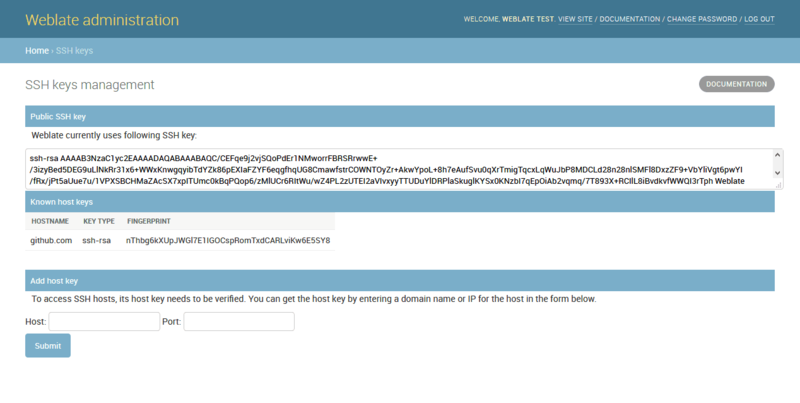 For example the GitHub URL with authentication might look like https://user:your_access_token@github.com/WeblateOrg/weblate.git. In case your username or password contains special chars, those have to be URL encoded, for example https://user%40example.com:%24password%23@bitbucket.org/...`. If you need to access http/https VCS repositories using a proxy server, you need to configure the VCS to use it. The proxy setting needs to be done in the same context which is used to execute Weblate. For the environment it should be set for both server and cron jobs. The VCS configuration has to be set for the user which is running Weblate. You can access GitHub repositories by SSH as mentioned above, but in case you need to access more repositories, you will hit a GitHub limitation on the SSH key usage (one key can be used only for one repository). There are several ways to work around this limitation. For smaller deployments, you can use HTTPS authentication using a personal access token and your account, see Creating an access token for command-line use. For a bigger setup, it is usually better to create dedicated user for Weblate, assign him the SSH key generated in Weblate and grant him access to all repositories you want. You can also use Git remote helpers for supporting other VCS as well, but this usually leads to other problems, so be prepared to debug them. This just adds a thin layer on top of Git to allow push translation changes as pull requests instead of pushing directory to the repository. It currently uses the hub tool to do the integration. There is no need to use this to access Git repositories, ordinary Git works the same, the only difference is how pushing to a repository is handled. With Git changes are pushed directly to the repository, while GitHub creates pull requests. Thanks to git-svn, Weblate can work with subversion repositories. Git-svn is a Perl script that enables the usage of subversion with a git client, enabling users to have a full clone of the internal repository and commit locally. Weblate tries to detect Subversion repository layout automatically - it supports both direct URLs for branch or repositories with standard layout (branches/, tags/ and trunk/). See git-svn documentation for more information. Changed in version 2.19: In older versions only repositories with standard layout were supported.